With more and more players playing on their smartphones and tablets lately, it was only a matter of time before someone hit Slotland's site-wide progressive jackpot while playing on a mobile device. 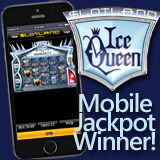 Last week, Johnathon E. won $159,357 playing the Ice Queen slot game on his cell phone. He was in bed at the time. The winner said that although Ice Queen is his current favourite game,he’s also been playing the new Treasure Island slot quite a bit lately too. Slotland's first mobile jackpot winner says the first thing he’s going to buy with his winnings is a new phone. “I’ve been wanting an iPhone 5 and now I don’t think I need to deny myself any longer!” said the excited jackpot winner. He also said he’s been trying to find a nice retirement community for his elderly mother and this win gives him more options. This isn’t the first Ice Queen jackpot winner. Just before Christmas, Charles N. won $182,782 playing the deluxe slot game. A favorite in the instant play online casino, Ice Queen is also one of more than a dozen mobile slots that have been especially enhanced for iPhone, Android and Blackberry.